Marine Electronic Instruments, Antifouling, Anti-Osmosis Products, Enamel and Varnishes, Fridges, Tender Arimar and Tender Nautiline, Hidea Outboard, Trolling Motors, Batteries, Battery Charger, Inverter, Nautical Hardware, Chain, Mooring Ropes, Anchors, Winches and more yet.. Designed for those who need the best performance and a high power on 4 channels so that the fader can be controlled from the source. This battery charger does not have a power supply function and as such in order to provide voltage and current it needs to be connected to a battery with a minimum voltage of 10.7V. 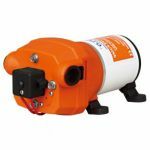 Suitable for pumping bilge water, saltwater or diesel transfer. Seaflo hand pump compact design easily installed in tight bilge spaces where other pumps simply cannot fit. Flopower Seaflo Self-priming autoclave 12V 10lt/min 17PSI 1.2bar, Amp: 2.2/h, protection pressure, size: 89x99x203mm. Ideal for water circulation systems for yachts, caravans, spraying systems or cleaning machines etc. Max Flow rate: 12.5 l/min. Max Pressure: 2.4 bar. Duty Cycle: Intermittend (under different pressure the continuous working time will also be different). 24V. Max Flow rate: 17 l/min. Max Pressure: 2.8 bar. Duty Cycle: Intermittend (under different pressure the continuous working time will also be different). 12V. Seaflo 12V automatic pump low consumption with thermal protection against overloads, 3.8lt/min flow, 35PSI 2.4 bar pressure, it can feed 2 taps at the same time. Ideal for sprayers, cleaning machines, air humidifiers etc. Special Offer Quick Windlasses Prince Series DP3 712 500W 12V with 50mt D.8mm Galvanized Chain. Special Offer Quick Windlasses Prince Series DP2 1012 1000W 12V with 50mt D.8mm Galvanized Chain. 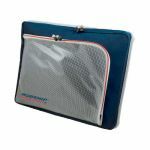 Complete kit fenders Polyform F2 with fender covers Blue Navy polyester sponge and fender holders of stainless steel 2 places to accommodate in an elegant way into one complete kit! 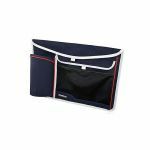 Complete kit fenders Polyform F2 with fender covers Blue Navy polyester sponge and fender holders of stainless steel 3 places to accommodate in an elegant way into one complete kit! Anchoring kit for boats up to 6 meters with hot-galvanized steel Hall anchor 6.2 kg, calibrated chain galvanized steel DIN 766 Ø6 mm, Stainless steel spinning wheel, pack spliced polyester rope and connector chain-rope in a single solution kit! Anchor kit for boats up to 6 meters with 5 kg Trefoil anchor in hot-galvanized cast steel, calibrated chain in DIN 766 Ø6 mm galvanized steel, stainless steel swivel connector, spliced polyester rope and connector chain-rope in a single solution kit! Anchor kit for boats up to 8 meters in hot-galvanized steel DANFORTH anchor 6 kg, calibrated chain galvanized steel DIN 766 Ø8 mm, stainless steel roll connector, pack spliced polyester rope and connector chain-rope in a single solution kit! Anchoring kit for boats up to 8 meters with hot-galvanized steel Hall anchor 8.8 kg, calibrated chain galvanized steel DIN 766 Ø8 mm, Stainless steel spinning wheel, pack spliced polyester rope and connector chain-rope in a single solution kit! Anchor kit for boats up to 8 meters with a Trefoil 7.5 kg anchor in hot galvanized steel, calibrated chain in DIN 766 Ø8 mm galvanized steel, stainless steel swivel connector, spliced polyester rope and chain-rope connector in a single solution kit! Calibrated galvanized steel 316 DIN 766 anchor chain - D.12mm - 50mt. Breaking load 6500kg. 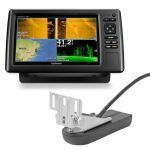 Fish with the Power of CHIRP 9-inch color display 480x800 pixel WVGA with keypad control, available with a transducer with high wide CHIRP GT52HW-TM transducer (12-pin), 250W and CHIRP DownVü™/SideVü™, 455/800 and 350W. 7-inch Fully Network Capable Chartplotter. 7-inch multi-touch widescreen display (800 x 480 WVGA) with worldwide basemap. Display size 15.5x8.6 cm; 17.8 cm diagonal. 7-inch Multi-touch Widescreen Chartplotter/Sonar Combo. 7-inch multi-touch widescreen display (800 x 480 WVGA) with worldwide basemap. Display size 15.5x8.6 cm. IPX7. 8-inch Fully Network Capable Chartplotter. 8-inch multi-touch widescreen display (1024 x 600 WSVGA) with worldwide basemap. Display size 17.8 x 10.2 cm; 20.3 cm diagonal, IPX7.